Two weeks ago we released an updated version of our Pocket Sounds application, to test the waters with Apple’s relatively new iAds platform. Our goal was not to make money (we even gave our users a way of turning the ads off), but to find out if this was actually a viable way to release applications. We were also curious as to just which countries iAds did and didn’t work in, since there were a lot of conflicting reports. 12,600 people upgraded to this new version, which is a relatively small amount, but it does give us enough data to draw some conclusions. Of the 6,175 requests from Japan and 3,480 requests from Australia, 0 were actually served. This seems to conflict with recent reports we’ve heard about iAds being enabled in Australia. This matches up with my experience though, as I have several apps that say they have iAds in them, but I’ve yet to see a single advert served to me. 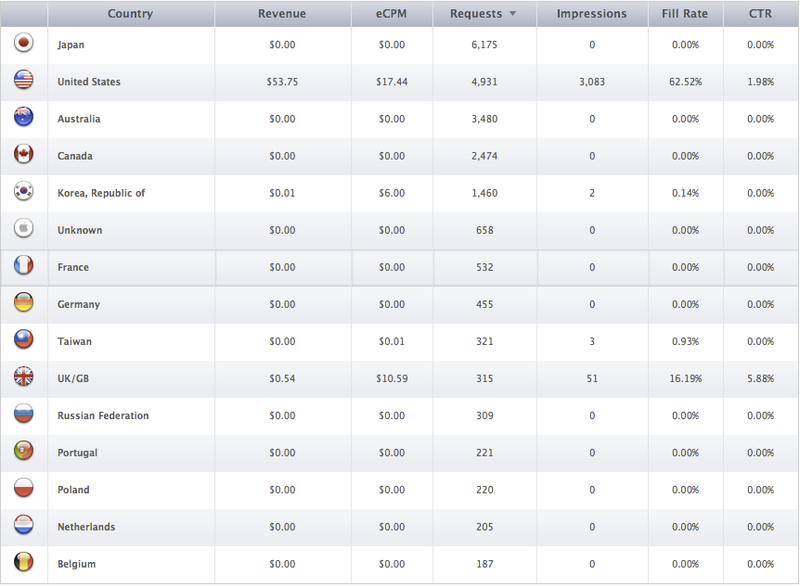 So at about 400 impressions a day we make $6 a day…or as we like to say FREE COFFEE! Draw your own conclusions if you like, but ours would be that unless most of your customers are in the US and UK then iAds are not really viable just yet. We’ll keep you posted should things change.